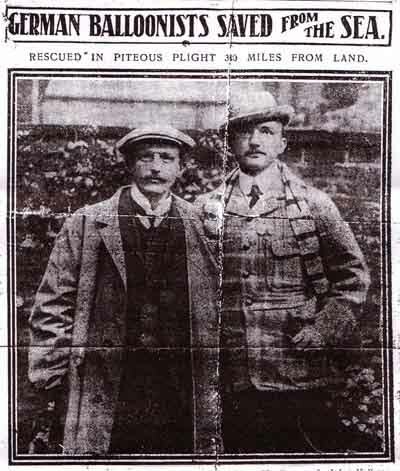 Pictured above are German balloonists Herr Hochstetter and Schreiterer who were saved on 14 October 1909 from a watery grave by Newby Wyke Brewers Great Grandfather William March. Skipper March on his trawler "Ruby", along with mate, spotted the balloon at 11.30am some 8 miles away, presumably in the water. The Skipper made full steam to save who he could. They had to chase the balloon which was skidding along the surface. Schreiterer was able to swim to a boat launched from the Ruby, the balloon was now floundering so the Skipper took the Ruby direct to the balloon. The balloon flopped onto the Ruby and was pierced by the mast, a boat launched from the Ruby got up to the balloon. Hochstetter looked dead, but was pulled from the balloon and returned to the Ruby and revived. Subsequently, the German Emperor presented Skipper March with a gold fob watch engraved with the Kaisers crest and all the crew got the equivalent of a years wages as an award for bravery from a grateful Germany.